I also learned that Metaxa is a Greek liquor that my dad wanted, and it was important he get the seven star. That I did not get to taste. It wasn’t until a bottle of the seven star arrived in preparation for Thursday Drink Night (TDN) that I finally could put a flavor to the memory. Metaxa was created by Spyros Metaxas in 1888. It has an astonishingly complex production process. Various wines, mainly Savatiano and Rhoditis, are distilled and then aged in limousine oak barrels. The stars (3, 5, 7, and 12) on the label represent how many years the distillates have been aged. Wine is matured separately in used Metaxa barrels for two years . Then the brandy and wines are mixed with a secret blend of herbs and spices, including rose petals. This mixture is aged for another 6 months before being chilled and filtered prior to bottling. The rose scent is evident on the nose. I was expecting the taste to be somewhat sweet from the additional wine, similar to pineau des Charentes, but it’s really more in line with most brandies I’ve tasted. In retrospect, this shouln’t have surprised me, given that it’s 80 proof (40% ABV). The general spices are well blended, with the rose bringing an interesting floral note that I quite like. There’s some honey and vanilla notes, and a hint of cinnamon as well, with an oakiness throughout. The spices linger longest on the tongue. Now it’s time to try mixing. I wanted to start with some complimentary flavors. Since Metaxa already brings wine and brandy, I thought it would be fun to add some tartness with green grapes. Greece also makes me think of baklava, dripping with honey, so I added some for a little sweetness and roundness. I didn’t want to add a liqueur, so I went with some gin instead to open up the Metaxa flavors without diluting it too much. Muddle the grapes and honey in a mixing tin. Fill with ice, add Metaxa and gin, and stir for at least 30 seconds. 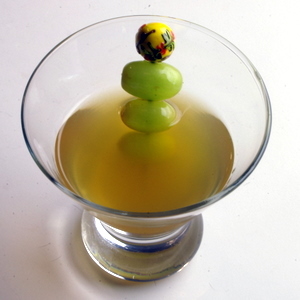 Double strain into cocktail glass and garnish with additional grapes. Join us at the Mixoloseum for TDN with your bottle of Metaxa 7 star and join in the fun. And as an extra incentive, the person who submits the best Metaxa cocktail will receive a bottle of blueberry bitters and will be entered into Imbibe’s Ultimate Metaxa Cocktail Competition and get the chance to win his or her own trip to Greece! Actually, I won a free round trip on TWA to any place they flew. 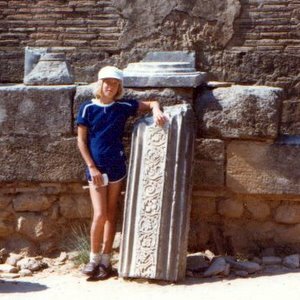 I was obsessed with Greek mythology, so Greece it was. A story I’ll tell if I ever get a bottle to reevaluate my traumatic childhood memory against.